SpaceX has confirmed they will attempt to land their Falcon-9 first stage booster on a floating offshore barge after launching the Jason-3 satellite from Vandenberg AFB (VAFB) in Southern California, currently scheduled to launch No-Earlier-Than (NET) Jan. 17. The mission will be the first of 2016 for SpaceX, and the first launch from American soil for a very busy U.S. space launch manifest this year as well. The Earth-observing Jason-3 satellite will be sealed inside the Falcon rocket’s protective payload fairing today, while launch and mission managers convene for the Flight Readiness Review (FRR) before clearing the booster for a standard static fire “launch dress rehearsal” to test its nine Merlin engines this weekend. UPDATE Jan 9: The FRR concluded Friday evening, and managers determined that work should proceed toward a launch on Sunday, Jan. 17. The static fire of the Falcon-9 is now scheduled for Monday, Jan. 11. The spacecraft—nestled inside its payload fairing on behalf of the National Oceanic and Atmospheric Administration (NOAA), NASA, and France—will be mated atop the Falcon-9 on Tuesday, Jan. 12. Liftoff of Jason-3 from VAFB Space Launch Complex 4 East on Jan. 17 is targeted for 10:42 a.m. PST (1:42 p.m. EST), at the opening of a 30-second launch window. If needed, a backup launch opportunity is available at 10:41 a.m. PST (1:31 p.m. EST) on Jan. 18. The launch will come a month after SpaceX closed out America’s 2015 launch manifest with a very successful “Return to Flight” mission from Cape Canaveral, Fla., which delivered 11 Orbcomm OG-2 satellites to orbit atop SpaceX’s new and improved Falcon “Full Thrust” rocket, a highly modified and upgraded version of their evolvable Falcon-9. The satellites were delivered as planned, but SpaceX made history that night when they landed the rocket’s first stage back at Cape Canaveral 10 minutes after liftoff. That booster is now back in a SpaceX hangar at their Launch Complex-39A at NASA’s Kennedy Space Center to undergo a series of tests, including putting it on the transporter erector and rolling it out to the pad to complete fluid checks, electrical checks, and propellant loading. SpaceX signed a 20-year lease for the former Apollo and space shuttle launch site in spring 2014. “The plan is to do a static fire on the launch pad there to confirm that all systems are good and that we’re able to do a full-thrust hold-down firing of the rocket,” said company CEO Elon Musk. Ultimately, the whole point of trying to bring back boosters is to make the Falcon-9 a truly reusable launch vehicle, capable of rapid turnaround time in order to launch more payloads, at a fraction of the current costs. The OG-2 booster now at 39A, however, will not fly again, even though SpaceX is confident it could if needed. “I think we’ll probably keep this one on the ground because it’s quite unique, it’s the first one we brought back. So I think we’ll probably keep this one on the ground and just confirm through tests that it could fly again and then put it somewhere to display,” said Musk. SpaceX currently holds a manifest backlog of some 50 missions, with an estimated value (according to SpaceX) of roughly $7 billion. SpaceX has attempted to land a first stage Falcon-9 on their Autonomous Spaceport Drone Ship (ASDS) previously, but not with the success of the OG-2 booster at Cape Canaveral last month. Each time SpaceX hit the mark, but both times the booster tipped over. An attempt to land during the CRS-5 launch in January achieved partial success, reaching the deck, but impacted hard at a 45-degree angle and exploded, primarily due to a premature exhaustion of hydraulic fluid in its hypersonic grid fins. A second attempt was planned for the DSCOVR launch in February, but was called off due to rough sea conditions, and the most recent attempt during April’s CRS-6 launch reached the deck, but touched down with excessive lateral velocity and toppled over upon impact. Utilizing compressed helium to deploy its four extendable landing legs, the booster and a quartet of lattice-like hypersonic grid fins, configured in an “X-wing” layout, will then be unfurled to control the rocket’s lift vector, and a final single engine burn will slow the stage to a velocity of zero for a stable (hopefully) landing on the ASDS. Good luck to JPL and SpaceX for a successful launch deployment, and recovery! It’s a ship. It has engines. As such, a car is a ship. What about a lawnmower? Gooooooo SpaceX and make more history. Thanks for the Christmas present with the landed booster. While watching the landing, I forgot all about the negative news that is constantly being shown to us on line and TV. It gave everyone a moment to celebrate and be positive for a change….. Once again Go SpaceX!!!!!!! Out of a great story about an amazing aerospace feat, we get the incredible comment “it’s a ship, it has engines”. Nothing like wasting hardware, you can successfully land on ground why waste the time trying to land on a rocking platform at sea…. makes little sense. Even if it lands it will probably fall off at some point. The ASDS will still be used for heavy payloads where the launch requires more fuel and so the first stage does not retain enough fuel to boost back to the launch site. Additionally, the center core of the Falcon heavy will probably almost always be recovered at sea. Crew on nearby support ships will go to the ASDS after the rocket has landed to secure it to the deck. Reportedly, metal shoes will be welded over the feet of the landing legs, and I would expect some straps or cables to be used to further secure the stage as well. Not to mention GTO missions for regular F9. I would imagine a lot of these will require ASDS depending on payload mass. In either case Vandy doesn’t have usable landing pad yet and SpaceX must master ASDS landings down the road anyway, win, win. This launch is taking place from Vandenberg in California. There is no landing area there. Yet. There is a landing pad in Vandenberg under construction/finished, its on SLC-4W (the launch pad is on SLC-4E). There are a couple of possible reasons for SpaceX opting for a barge landing with Jason3. There have been reports of a big tent erected on the landing pad the last two months. The extension to the previous FCC application about the barge, shows its location a lot further out from shore than before (280km vs 74km). This means that the launch and landing mission profile has changed. One possible reason for that would be to use the experimental landing attempt as a rehearsal for the even more challenging SES9 mission (where the barge will be placed more than 600km off-shore). 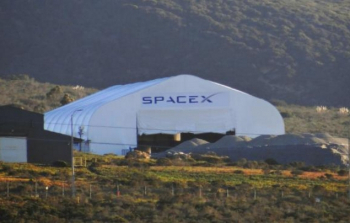 We know that SpaceX need an FAA approval to attempt a landing in Vandenberg. Its a little trickier to get an environmental impact check mark there than in Florida, since the rocket will have to fly above a protected area with endangered species to get home. Who says it can successfully land on the ground? This flight will be with the last of the Falcon 9 v1.1 (pre Full Thrust upgrades) rockets. It may well not be capable of boosting back to land on this profile. As SpaceX expects they’ll still need the barges to recover center cores from Falcon Heavy launches, why not make the most use out of a launch that has to happen to get the customer’s payload in orbit? Finally! Out of all the articles about SpaceX I have read ( and I’ve read a lot of them ), this offers the most clear and accurate explanation of the landing procedure. Kudos! Thanks Alex. Unlike 99% of other publications & websites we are actually on the ground at the Cape & VAFB putting in work, face to face with SpaceX regularly asking questions & documenting their progress to provide accurate information.